Today I’m really excited to have Nathan Resnick back on the show. If you don’t remember Nathan, he is the founder of Sourcify which is a company that helps you find manufacturers to produce your products. Anyway, Nathan has been on television multiple times in the past month to talk about the Trump tariffs and since he’s an expert on the topic, I thought I’d have him on to discuss his thoughts. Enjoy! Intro: You’re listening to the My Wife Quit Her Job Podcast, the place where I bring on successful bootstrapped business owners and delve deeply into what strategies are working and what strategies are not in business. 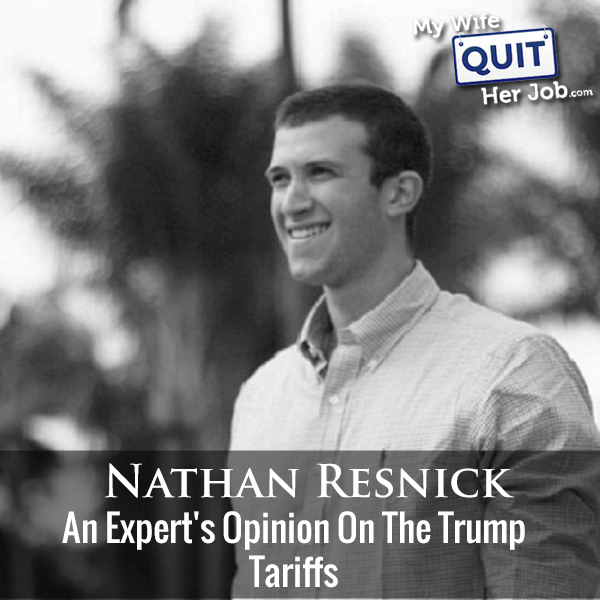 Now, this week, I invited my buddy Nathan Resnick of Sourcify to give his expert opinion on the Trump tariffs. We talk about which products are affected and how to best avoid the brunt of the impact. But before we begin, I want to give a quick shout out to Klaviyo who is a sponsor of the show. And I like Klaviyo because they are the email marketing platform that I personally use for my ecommerce store, and I depend on them for over 30% of my revenues. Now Klaviyo is the only email platform out there that is specifically built for ecommerce stores, and here is why it is so powerful. Klaviyo can track every single customer who has shopped in your store and exactly what they bought. So let’s say I want to send out an email to everyone who purchased a red handkerchief in the last week, easy. Let’s say I want to set up a special auto-responder sequence to my customers depending on what they purchased, piece of cake, and there is full revenue tracking on every single email sent. Now, Klaviyo is the most powerful email platform that I’ve ever used and you could try them for free at mywifequitherjob.com/K-L-A-V-I-Y-O. Once again, that’s mywifequitherjob.com/K-L-A-V-I-Y-O. I also want to give a shout out to Privy who is also a sponsor of the show. Privy is the tool that I use to build my email list for both my blog and my online store. Now what does Privy do? Well, Privy is an email list growth platform and they manage all of my email capture forms. And I use Privy hand-in-hand with my email marketing provider. Now they’re a bunch of companies out there that will manage email capture forms, but I like privy because they specialize in e-commerce. Right now I’m using privy to display a cool wheel of fortune pop up. Basically a user gives their email for a chance to win valuable prices in our store. And customers love the gamification aspect of this. And when I implemented this form email signups increased by 131%. So bottom line, Privy allows me to turn visitors into email subscribers, which I then feed to my email provider to close the sale. So head on over to Privy.com/Steve and try it for free. And if you decide you need some of the more advanced features, use coupon code MWQHJ for 15% off. Once again, that’s P-R-I-V-Y.com/Steve. Now onto the show. Steve: Welcome to the My Wife Quit her Job Podcast. Today, I’m really excited to have Nathan Resnick back on the show. And if you don’t remember Nathan, he is the founder of Sourcify, which is a company that helps you find manufacturers to produce your products. And prior to that, he owned two e-commerce companies, Yes Man Watches and Cork Supply Co., and recently actually, he spoke at my annual e-commerce conference, the Sellers Summit. Anyway, Nathan has actually been on TV multiple times in the past month to talk about the Trump tariffs. And since he’s an expert on the topic, I thought I’d have him on to discuss his thoughts. And with that, welcome back on the show Nathan, how are you doing today, man? Nathan: What is up? I’m doing great. Thanks so much for having me. Steve: So first off, can you just kind of summarize why Trump has issued these tariffs in the first place? And what kind of are his demands from China at the present time? Nathan: It’s crazy. And I kind of want to start the conversation saying, I’m not political at all. But what I’ll say is, these tariffs are crazy. And I think he is trying to position himself with these tariffs thinking that these products are going to now be produced in America, which there are companies that we work with are rapidly diversifying their supply chain across Asia. And so for him, and I think the US government is just a way for them to make money. Really what Trump doesn’t even realize it and what he said actually, last week is that China is now paying us billions of dollars in tariffs, but really tariffs are paid for by American companies that are importing products from China. And so it’s really in my mind just a bit ridiculous, but at end of the day tariffs are a way for the US government to make money or to balance out trade. And if you look at the trade between America and China, there’s a huge deficit. We’re importing way more than we are exporting to China. Steve: I know, but realistically does the US have the infrastructure that China has to produce all these things at low costs? Nathan: Oh, we don’t. I mean, that’s really the global economy. If you look at it from my more bird’s eye view, there’s a reason products are produced outside of America. And the reason being is it’s just the way that the currencies work. If our dollar equals 6.8 renminbi right now, then you know that our dollar is going to go further there. And really, I almost break it down to the ground floor. When you’re in Guangzhou or Shenzhen, let’s say you’re going to the Canton Fair coming up here in October, and you’re over there and you’re going out to dinner, you’re probably spending almost a fifth or a 10th less on dinner than you would here in America. And that just shows the way the international economy work is that our dollar goes a lot farther. And you know what; you know the Chinese government is doing? And I’m not exactly sure if I should say this in this way. But they’re actually, they’re putting, they’re making the renminbi at almost their all time low a year low. So right now, the dollar is extremely valuable compared to the renminbi. And so our dollar is going to go a lot further than it would last year, a year before, and the reason being is the Chinese government, they’re trying to enable US corporations to have more buying power in China, even with these tariffs. Steve: Hmm-mm interesting. Okay. But then, doesn’t the factory kind of get screwed over then? Nathan: Well, in this case, the factories are really screaming. I’ll tell you, I was in China two weeks ago at our Guangzhou office. And you go to these, even the fabric markets there in Guangzhou and everyone’s screaming, they’re saying, hey, well buy fabric here, but can we send it to Vietnam? Can we send it to the Philippines? Can we send it off to Cambodia? And even at Sourcify, when we work with these companies to produce products across Asia, there’s probably been about a 30 to 40% increase in companies requesting to produce products outside of China, and I’m talking in India, Vietnam, Thailand, the Philippines. And if you look at larger enterprises, if you look at the Nikes or Adidas of the world, these organizations have already been producing outside of China for a long time. And so really, what’s scary with these tariffs is that in my mind, they’re just starting. Trump just put a 10% tariff on $200 billion of Chinese products last week, and that tariff is going to be increased to 25%, starting January 1, 2019. Now, they’re still actively negotiating and trying to figure out really what’s going on with this trade war. But if you’re an e-commerce company, and all of a sudden, you have to pay 25% more tariffs, you’re going to want to figure out, how can I avoid that tariff? And I’m happy to dive in the ways that you can avoid the tariff. Some, I will say will be legal, and some are a bit under the table. But I’m not recommending the under the table ways at all. Steve: So before we get into that, can you just give us a quick update on kind of the current state of the tariffs and what products they are affecting, kind of give us a timeline and how it started out and where we are today? Nathan: Yeah, a hundred percent. So it started out a few months ago. And really, originally, it was more so targeting industrial and agriculture products, where you’re talking about steel, you’re talking about soybeans, you’re talking about products that will probably not affect your general e-commerce entrepreneur that’s selling consumer products. And then all of a sudden last week, tariffs got put on electronics, cosmetics, clothing, home, and home furnishing products and TVs. I mean, these tariffs now are really actively affecting HTS codes that companies like you and I are importing under. And so it started to all of a sudden have an effect in the e-commerce world. And really, that’s scary. I mean, if you’re an e-commerce entrepreneur, that’s just starting out running on thinner margins. These tariffs are going to have a direct effect on your business. And really probably the first question that comes to mind right there is, how do I find out, how do I know if these tariffs are affecting my product? And so what I do right now is really ask your freight forward. If you’re importing products, even just at a smaller scale, whether it be a pallet or just one container, so ask your freight forward and say, hey, do I have to pay a higher tariff? And your freight forwarder should know, right off the bat if your HTS codes that you’re importing under are affected. And really, that’s the first way that you start, you can also definitely go on Google and do some research yourself. But I think at the end of the day, your freight forwarder should have the most knowledge in regards to all your products affected. Steve: Okay and then what impact would you say the tariffs are going to have on larger businesses like we were talking about CVS earlier, versus smaller businesses? Nathan: I mean, it’s crazy on the larger scale. They’re hurting; they’re trying to avoid them as fast as they can. I mean, there was this story, it must have been two months ago, where there was this company that was trying to import or it was they were actually exporting, because on the other hand, China has lifted tariffs on products that American companies are trying to sell into China. So it’s back and forth, these trade wars, but there was this company that was exporting soybeans from America to China, they literally missed the cutoff time by 30 minutes. And they started paying $12,000 a day just to have their container ship off the port waiting to figure out what’s going to happen with these tariffs. Because if they have brought those soybeans to port, they would have to pay $6 million in new tariffs just based off these new tariff increases. And so from a larger scale from these larger enterprises, the effects are huge. And so what these companies are doing are diversifying their supply chains very fast, which means a lot of these production lines in Vietnam or India are a lot of times already booked their capacity for the next year. You really have to dive deep and figure out who is going to be a supplier that still has some capacity for your products outside of China, or you find ways to diversify or get around these tariffs in maybe not the most cleanest way. Steve: So, what would you say is the short term impact versus the long term impact? Are you already starting to see prices increase? Nathan: Yeah, I mean, I would say short term impact is that you as a company need to start negotiating right away with your factory to see how can I balance out these increased tariffs, because on the factory side of the table, you’re going to want to try to lower costs there and cut your unit costs on that end. On the consumer side of the table, we as American consumers are going to have to start paying more for these products. I mean, I actually wrote this down as estimated by students at the London School of Economics, that each American citizen is going to have to pay $127 more over the course of the year for average products that they’re buying, whether it be TVs, or clothing, and washing machines. I mean, you’re really going to see a direct effect. And, at the larger enterprise level, you have toy companies like Hasbro that are saying during their earnings call last week that the company will move production outside of China immediately as fast as they can. And so, not only are you seeing the effect with just families here in America and having to spend more for products, but larger enterprises are having to figure out how they can really diversify their supply chain. Steve: So, let’s say I needed to — let’s say I wanted to negotiate with my vendor, would you mention the Chinese renminbi against the US dollar? Like, does it all kind of balance out right now, when it’s only like a 10% tariff? Nathan: Yeah, I would say 10% tariff. It depends how much you’re importing. But yeah, it definitely does balance out in some sense. I would say too, though, from the factory perspective, I know even our supply chain team, they’ve been getting a swap just with inbound requests from factories outside of China saying, hey, we can enable you to produce these products and avoid these China tariffs. And so even on the factory end of the table, you have factories, sales reps that are now hitting us up outside of China more activity using these tariffs as a sales pitch. And I would say inside China, the smarter factories are saying, hey, well, the renminbi is that almost a year low, we’re really trying to balance out our currency here. And so there’s not a huge effect. I think it also just depends how you pay your supplier. I’ve heard of a lot of e-commerce entrepreneurs having great payment terms with their suppliers, not having to pay right up front, or 70/30, excuse me, 30/70 or maybe having 60 day payment terms. If you can flow some of your cash with production, then you might be able to have less of a direct effect right now with these tariffs. Steve: So, I mean, is it just a really bad time to import from China? Nathan: Yeah, I mean, well, especially right now with the holiday season coming in, even the freight lines are crazy, all industry is going nuts trying to ramp up for the holidays. And with these tariffs, it’s really, I think, become a bit of a mess. But I think the smarter companies are planning long term. If you’re a company doing business right now, you probably already got your holiday season planned out. You’ve got your POs in for the holiday season, and are already midway through production. And hopefully, especially if you’re producing in China with the Chinese New Year and the Spring Festival coming up there in February, that you’re going to have production in inventory ready to last yourself throughout that time period. Because otherwise you’ll probably run out of inventory or just probably take a trip to Vietnam or India, or Thailand or something. Steve: I guess the reason why I’m asking that is I was wondering if you have any predictions on what will happen and whether this will get resolved, whether you should hold out on buying large amounts of inventory until this kind of blows over? Nathan: That’s a great question. I mean, from what I’ve seen in the media, I’ve talked to reporters at CNN and CNBC, and Forbes. And it’s very interesting because from the news perspective, I mean, this is great press for the newscasters. I mean, they love talking about this, and I honestly think it’s going to become, it’s going to continue to rise. I think Trump really has it in his mind that by putting on these tariffs, he thinks that number one; he thinks that China is paying for these tariffs, which is not true. And number two, he thinks that we’re going to see a shift in production back to America, which I don’t believe is going to happen, just because it’s going to be way too expensive to produce most of these products here in America. And so I think hopefully, he’ll come to a realization and the government will come to a realization that really what this is causing is just American consumers and companies are paying more for these products. And these companies are now just diversifying their supply chain outside of China, or making some tricks under the table to avoid these tariffs. Steve: Okay, so let’s talk about that now. What are some ways to avoid these tariffs? Nathan: Yeah, so we’ll divide by legal versus illegal. And I do not recommend the illegal. Steve: Start with the illegal stuff first because I’m sure [overlapping 00:15:35]. Nathan: Yeah, I mean, so, right off the bat, you have transshipments. And transshipments are legal and transshipments, what they are, is when you’re sipping a container, let’s say from Guangzhou to Long Beach, and you have to ship the cargo, ship has to stop in Malaysia, or Thailand or whatever maybe. But what a lot of these freight foreigners are offering now is with these transshipments, they’re going to change the country of origin on your products. So they’re literally telling you, do not put those made in China labels on your products, we’ll change the country of origin during the transshipment when we stop over in Thailand, or Malaysia, or whatever may be, so your products are actually on paper imported from China. And so that’s one way to avoid this. Trans shipments are legal, but the act of actually changing the country of origin on your products is illegal. On the other hand, this is something that’s probably a bit more common in general, with smaller scale e-commerce entrepreneurs, or companies that haven’t necessary gotten the scale, but just lowering the value of the actual Bill of Materials, saying that, instead of buying this product for $10 per unit, you’re buying it for $1 per unit. And so the actual tariffs that can be levied on your products is much lower. So instead of having a total dollar amount of 10,000, you have $1,000. And so, really at the end of the day when tariffs are applied to the import value of your products, the value of the products is much lower than they actually are. And so you kind of slide into the cracks that way. Steve: Hold on Nathan real quick. I know some of my vendors had done that for me without even me asking. Nathan: Well, yeah, I mean, it helps them too, because they also have to pay an export tax in China. So it is in some sense win-win, but is it actually legal? Steve: What is the risk actually, is what, because I feel a little uncomfortable by it. I mean, this happened a lot early on. And so have you known people to get caught by this? Nathan: Not on a small scale. There’s definitely been some fines at a larger scale, but the border patrol and just the organization that is really balancing out these tariffs and forcing them, they’re not going to have time to deal with companies that are importing $10,000, or even sometimes even $100,000. In the grand scheme of things, it’s not that much. And so, the risk of getting in trouble at that level is extremely low. At a larger level, if you have companies like Bass Pro, one of the biggest toy makers in the world, if they get caught doing this, there’s definitely some questions and media attention that will come their way. So I would say, as a e-commerce entrepreneur, the risk is very low. And really, the other solution that I want to note on is actually doing fulfillment at or in China, for example. So, if you’re importing products, and they’re under $800 per parcel, you actually are exempt from customs duties all together. And so what we’ve seen actually is number one, a lot of fulfillment companies or a lot of factories start to offer fulfillment options in China. So you’re shipping products direct to consumer from Asian based fulfillment centers, whether they be in Hong Kong or in China, and shipping these products directly to consumers here in America. Your shipping rates are definitely going to be a bit higher; it depends on the shipping method you use. And also, sometimes I think, just with international logistics, if you’re shipping product, just one by one from overseas, it’s got a higher risk of it getting lost or damaged in the mail. So I don’t know if that’s the best option. Steve: But is that a realistic option? Nathan: I mean, there’s companies like actual companies I know top of mind, one called Fulfillment and one called the Floship. They both have facilities in Hong Kong and Shenzhen, I think. And they’re doing D2C fulfillment out of China, and they’ve had success there. There are companies that work that way. I would say, a lot of times, though, you see more kind of drop shipping oriented type of companies shipping through this route, because just the customer experience doesn’t have that high of a level. I think, with today’s world with two day Amazon Prime shipments, consumers expect the product to come fast. And when you’re shipping from a fulfillment company in China, obviously, the products aren’t going to come as fast, probably a week at the fastest. And so it’s something to consider when you think about your customer experience. But at the end of the day is it an option to explore? Yes. Steve: So in regards to relabeling the boxes to have a different country of origin that sounds kind of risky to me. Nathan: Yeah, it definitely is. I mean, it’s not something that I am recommending by any means. But it’s a way that some companies are avoiding these tariffs. And I think that the end of the day, you got to sometimes explore all options. But I would say the best way to avoid these tariffs is to explore other options to produce in other countries. And I know, for example, we have companies that we work with right now that sell into large retailers like Wal-Mart and Target that are producing in India and Pakistan, and finding way better rates producing in those countries than China, because the labor rates, it’s crazy right now in China, with the growth of the economy and the infrastructure there, labor costs have definitely gone up. And when you think of a product like arrow [ph], or clothing, or even any bag, like the main cost outside of the actual raw material is actually the labor. So when you’re having to spend let’s say half an hour to produce a bag or something, that’s labor cost. And so if you go to India or Pakistan, where the labor costs are even less, you’re going to be able to have better production rates. And so that’s something that I’d really look into. There are some great factories outside of China. And, it’s crazy, like when I look at China, when I was first over there 10 years ago, and look at it today, 10 years ago, you go to a factory and they’re picking you up in a pretty rundown car, there’s not all these nicely paved roads and there’s not all this crazy traffic. And now you go to these factories, you getting picked up in Range Rovers and Mercedes Benz and you’re thinking to yourself, they must have made some money on some of the margins with their production runs. Steve: So given that, like let’s for like the little guy, how would you find suppliers in countries outside of China? Like, there’s no Alibaba for like Pakistan or Vietnam? Nathan: Yeah, it stems from network I think 100%. And even here at Sourcify, it stems from our network, when we go into these other countries. And I’ve done trips this year alone to Vietnam, Thailand, and the Philippines, and have one plan for India later this year. And it’s a different ecosystem. Number one, when I go to China, China is a great country, don’t get me wrong, but am I going there to enjoy the environment, no. When I was in the Philippines, I mean, we’re looking at this factory in the south in the city called Zamboanga and the beach was right across from the factory. I was like, wow, this is actually great environment, I wouldn’t mind hanging out here for a few days. Whereas, when we’re in a factory in China outside of Guangzhou or wherever may be, it’s not always the nicest area. And so, I would say for a smaller buyer, like there’s definitely some different trade shows, you can exploit, there’s the gifts and premium show in India. I think it’s later this month, I think it actually coincides with the Canton Fair. I can double check, and I’ll send you the dates on that later. But, I mean, there’s definitely some other trade shows in other countries. And what I would do too, is you actually can Google some of the trade organizations that they have in these countries. There’s free economic zones, there’s the Clark free economic zone in the Philippines, there’s the Zamboanga free economic zone in the Philippines. These organizations are actively looking to boost local trade. And it’s amazing, because these free economic zones; they have no import or export taxes for companies that are set up in these zone so a lot of factories go there. And there’s no taxes or very little taxes for these companies in these free economic zones. And so, if you’re working with a factory that’s in a free Economic Zone, you could literally be importing product into that free economic zone for free and exporting that finished product for free back to your home country. And there’s been talks I know with the Philippines and America to get into some sort of free trade agreement. And NAFTA, the North American Free Trade Agreement just got resigned, which is awesome. So, you could explore options to produce in Mexico. And down just south of the border in San Diego, you have the Economic Development Council of Baja and the tier one or region there. Steve: So I know that when I go to like the Canton Fair, I know it’s actually worth my time, because the trade show is just so large. But these ones that you mentioned, I think you mentioned one in India, is it a much smaller scale? Like, how can you be a lot more efficient with your time and finding these factories that are outside of China? Nathan: Yeah, I mean, I would say it stems from network. So, feel free to ping me up to try to introduce you to some people outside of China. I would say, for any e-commerce entrepreneur going to some of these smaller shows, it’s probably not going to be worth your time. I mean, I think the beauty of the Canton Fair is that you have so many different factories at your fingertips there. But what you could explore is there’s some trade shows here in America. I was at a magic sourcing trade show and the sourcing direct show at ASD market week in Las Vegas. And those aren’t big shows from a sourcing perspective, especially compared to the Canton Fair, but they actually diversify the amount of suppliers that they had there. There was a lot of booths there from Turkey, from India, from Vietnam, from Korea, it was pretty cool. I mean, honestly, and a flight to Vegas is usually pretty cheap. So it was pretty cool. I mean, that’s something that I would definitely recommend. I’ll send you the dates on when those trade shows are. Steve: Okay. Yeah, it sounds good. What about from an online perspective, though? Like, is there like some sort of directory or some central location where I can get access to a lot more of these factors that are outside of China? Nathan: None that comes to mind. And that’s probably a pretty big, good business opportunity right there, it’s creating some sort of international Alibaba. I mean, I think Alibaba does have some facilities and factories that are outside of China. And when you search, I mean, when you search Alibaba, you can specify the country, so you could try to just specify countries that are obviously not China and see what comes up. But as far as my knowledge, there is no go to online directory that’s focused outside of China. Steve: Okay. And is that something that you guys do though? Nathan: We definitely do diversify company supply chains at more of an enterprise level. At a smaller scale, I would recommend like the factory confirm Chrome extension that we have, I’ll send you the link for that. It’s pretty cool tool that enables you to analyze factories in real time. But I’m happy to help. For me, I’m a former e-commerce entrepreneur myself, and now just focus on the supply chain side of the business. And that’s what I love. Steve: I wanted to take a quick moment to tell you about a brand new service that I just like launched that will help you grow your email list for free. First off, my business is called Gobrandwin.com, and it’s a service that helps e-commerce sellers build their email list through group giveaways. And in fact, in our most recent giveaway, we managed to increase the email list size of the brands who participated by 40%. That’s right, we generated over 11,000 email subscribers, and the average list size of the companies participating in the giveaway was just 25,000. So if that makes you excited, here’s how the service works. If you own your own e-commerce brand, and you have a following, you must first contribute a gift card toward your products valued at $200 or more. And this is the prize for the sweepstakes. We will assemble gift cards from other participating brands with a similar customer demographic into one gigantic sweepstakes giveaway. All participating brands will send our co branded giveaway email to their entire customer base, driving them to a special landing page on Gobrandwin.com. We will acquire email addresses and Facebook pixel data. We will also send the giveaway entry forms to related influencers in our blogger database. And between my co founder Toni and I, we have access to almost 1000 bloggers in our database. Consumers will enter in their email addresses; we’ll send them special offers from your company, and select a grand prize winner. And after the sweepstakes is over, you will receive the entire list of entrants and instantly grow your audience. So bottom line, the concept is very simple. And it is absolutely free. We will help each other promote each other’s businesses, get free promotion from bloggers, and share the email addresses. So if you’re interested in growing your email list, then head on over to Gobrandwin.com, that’s G-O-B-R-A-N-D-W-I-N.com. And once again, it is 100% free. Now back to the show. Can you kind of describe generally I guess, what the infrastructure is like for China compared to some of the other third world countries like Pakistan, Indonesia? Nathan: Yeah, 100%. I mean, I’ll describe the Philippines right off the bat, because I was just there last month. And it’s a lot different when you think of the infrastructure. And I would look at it from almost the freight forwarding world where in China you have FOB in Ningbo, you have Guangzhou, Hong Kong, you have all these different major ports along the coast and you can ship containers very readily out of these ports. When you look at the Philippines, pretty much every factory is shipping FOB Manila. And so what that means is that they’re transporting and they’re taking responsibility for your product because it’s FOB terms that they’re taking responsibility for your product to get it to Manila to get it to that container ship or whoever your freight forwarder there that’s picking up the container in Manila and putting it on the cargo ship or air freighting it back to your warehouse. But there’s just not nearly as many ports that are shipping on FOB terms internationally in the Philippines or India or Thailand compared to China. And so from a logistical point perspective if you think about it from a factory side of the table, these factories are oftentimes spread out pretty far from these main ports and so they’re having to handle the transportation costs to get your product to wherever you have those FOB terms from. And I think also the other hand to if you ever get terms on DDP rates, then you’re going to have — it’s going to be harder. I remember in India most the production quotes that we get are all FOB or x works because DDP out of India, just with freight is a lot more complicated to calculate than out of China. Steve: Can you kind of comment on the prices of some of these countries compared to try to China? Nathan: Yeah, I mean, it’s pretty incredible. Really, especially for the cut and saw industry, like, let’s say you’re producing any sort of fashion item or bag or any kind of cut and saw oriented product, just because the labor rates outside of China, and India or Pakistan is much less. We’re talking about like t-shirts like a nice shirt that is literally you have like $2 and 20 cents for DDP like duty to the repaid delivered t-shirt that’s got a print on it and that’s got pretty good fabric. And so some of the rates are incredible but that’s at a much larger scale. I mean, that’s a really company that’s spending close to $10 million on production. And so their rates and the margins that these factories are making are much lower. But even then, if you can try to fit your production run in with a factory that is producing for a larger buyer, and sees the growth of your product and really likes your brand, and there’s not too much that separates the production line that they’re doing for this larger enterprise and you’re small e-commerce company, there could be great synergies to explore. And I think that’s really like the — it’s like a double edged sword. Like, it’s great that the supply chain world is so relationship based. But on the other hand, you have very little transparency. If I asked you right now, what’s the name of your factory? Like, I wouldn’t expect you to tell me, it’s just like, not that – it’s not a question that you ask other e-commerce entrepreneurs, because that’s like a trade secret, that’s a trade secret of your business. And so I think that’s like kind of the craziness of the supply chain world in the e-commerce arena, is that like, if you see a company that’s crushing it, and they’re selling socks, and you also want to start selling socks, well, you can’t just go up to that company say, hey, who’s your factory? I also want to start selling socks. They’d be like, well, why would we tell you and they’ll probably actually try to pitch themselves as a middleman that will produce socks for you. Steve: So, would you say in these other third world countries, that they tend to work with larger guys, like are there opportunities for some of the smaller people, or even the people that are just starting out to look there? Nathan: There is, I mean, it’s definitely smaller facilities. I would say, from a larger level, most of the facilities that we know, that we’re connected with are bigger, but there’s definitely a lot of growth in smaller facilities there. And I think the beauty of it too, is as a e-commerce entrepreneur that’s growing and looking to extend your product categories, it’s not going to make sense for you to go work with a factory that has 10,000 employees. If they can produce a million units a month, and you’re producing 10,000 units, it’s not going to make sense for them, or for you to work together. I mean, you’re going to be the smallest fish in their pond. And it’s very unlikely that they’re going to spend that much time or give you that much attention. And so for you, especially if you’re starting out, or just kind of starting to see some growth, it’s going to make much more sense to work with a smaller midsize factory that you can start taking up maybe 20 or 30% of their capacity with rather than just getting a percent capacity here, 5% there. I mean, really, I think the key to finding a good factory for e-commerce Company is finding one that they can grow with, finding one that they can really scale with and build a relationship with. Steve: I guess what I’m trying to get at is, what are the big disadvantages of going outside of China? Nathan: I mean, the disadvantages are I would say just the visibility. You have really, in China, the infrastructure is very strong, you have a lot of options, there’s a lot of material sources there with different fabric markets or raw material sources. And outside of China, it’s just not as developed. You’re going to places where sometimes they don’t have good internet access; sometimes they don’t have access even to running water. I mean, it’s really sometimes a bit crazy. And you look at some photos or some of the infrastructure in countries like India or Bangladesh, I mean, there’s flooding, there’s even it was crazy, like when I was in China two weeks ago, that typhoon hit, and I was flying out of LA, and my plane was delayed three hours because the typhoon was supposed to basically hit Guangzhou and we were supposed to land. And so you have especially outside of China, I think you are more prone to face more natural oriented disasters and more production problems. Whereas, in China, and especially if you’re working with a facility that has more inspection certificates, it’s more likely to be stable, it’s going to be a stable production environment. So you add more risks to the table. But that’s not to say you should be scared. I mean, I think it’s really important right now, especially with these tariffs in place that you are motivated and excited to explore other production opportunities. Steve: What about the other way around? Are the Chinese tariffs on US products, is that going to affect anything? Nathan: Yeah, I mean, it’s affecting companies that are exporting to China and China selling into China. Are many e-commerce entrepreneurs doing that right now? Not necessarily. Is that a huge opportunity? Yes. I mean, I know a lot of companies that have done pretty well in China, but it takes investment. You either got to go set up your own store on TMall or Taobao or find a distributor or really try to figure it out how to hit a molder niche in the Chinese market. And I think it’s much easier said than done. If you don’t have experience selling into China and don’t know how those consumers interact with your product, it’s going to be pretty challenging. I mean, I always find it surprising when companies ask about selling into China or other Asian countries because the market is so big and seemingly so untapped, but if you’re struggling to sell products to consumers that you know so well here in America, it’s very questionable to me how you think you can do so much better selling products in China, if you don’t know that market at all. Steve: Okay, I mean, we’ve been talking a lot about Philippines, Vietnam, Pakistan, but what are your thoughts on sourcing in the US at this point? Nathan: I mean, sourcing the US is an option that should be explored. I think that the costs are definitely going to be higher; the experience can be hit or miss. You definitely have a lot of US facilities that are going to give you sometimes even a worse experience than you would get producing abroad, but I think at the end of the day, it comes down to cost and your margin. And if you’re spending 30% more to produce your products here in America, and your brand doesn’t revolve around that made in America aesthetic, it’s probably not going to make sense for you as an e-commerce entrepreneur because if you’re spending 30% more to produce these products than your competitors, well then you can’t have that cost per acquisition that these other companies can take in because their margin is 30% higher than yours. Steve: I guess with the 25% tariffs coming down, that might even things out a little bit. Nathan: Yeah, but I mean, well, here’s what I would say though too, is in the e-commerce world, I would say, outside of your brand, really what it comes down to is your margin. If I know that I can produce my products for let’s say, even 10% less than you can, then I can go spend 10% more to acquire a customer while staying profitable. Whereas, you can’t spend that 10% more because you’re spending 10% more to produce your product than I am. Steve: Where are some places that you would go to find US manufacturers? Nathan: There’s sites like Thomasnet, there’s Makers Row is American based manufacturing marketplace that it’s pretty cool. Those are the two main sites that come to mind, Makers Row and Thomasnet. And that’s definitely some options that I would look into. I mean, I think there’s definitely opportunity to potentially produce in America, but I would first explore outside of China and other countries in Asia. Steve: Okay, so Nathan to kind of conclude this little talk that we’re having here, where do you see things going looking one year out just your own personal predictions? Nathan: Yeah, I mean, one year out, I would say companies that are smart are going to diversify their supply chain outside of China. I think China in general has gotten more expensive. I mean, when we started exploring production outside of China almost two years ago for some of the companies we work with, there was so much just amazement, because it’s really ripe with opportunity. When I look outside of China, when I look at countries like India, or the Philippines or Thailand, it almost reminds me of China 10 years ago, when companies were really starting to scale up there, and the infrastructure was just starting to grow. So I assume, and I think that companies are going to continue to transition production outside of China. I don’t, I honestly don’t think there’s going to be a huge shift of production back into America. And I do think these tariffs are going to affect a lot of consumers, a lot of American companies, and even Chinese factories. Steve: Can you real quick comment on these other countries outside of China, and what kind of their specialties are? So you mentioned like cut and saw, and was that the Philippines or Pakistan? Do these countries have some sort of specialty? Nathan: Yeah, so Pakistan, India can be great for leather, a lot of cut and saw fabrics, basically any textiles or bags, sometimes hats, shoes, you can produce across India, Pakistan, Vietnam, Thailand, and the Philippines. I would say more electronic oriented products; it’s going to be very hard to diversify your products outside of China. That area around Shenzhen, it’s just so good for producing electronics that I don’t really know anywhere else in the world that has that capability like that. But for other products, sun glasses I think are mostly in China, and even kind of all those little types of gadgets, those kind of small price products, it’s all done around Yiwu and it’s going to be pretty hard to diversify those outside of China. But there definitely are some hidden gems out there. And I really encourage people to look for production opportunities outside of China. Steve: So it sounds like the primary opportunities outside of China are in the textile space. Nathan: Yeah, textile, handbags, bags, backpacks, all that. Steve: Okay. And if you sell electronics, China is probably going to be the place to be. What about plastics? Nathan: Plastics, you can do some like injection molding in Vietnam, in India. China is definitely still really good for plastics, but there are opportunities to explore outside of China. Steve: Okay, cool. Nathan, this is a very enlightening talk. Where can people find you if they have questions for you besides on TV and MSN? Nathan: Yeah, I mean, they can find me on LinkedIn or Twitter, Nathan Resnick, and feel free to check out Sourcify. We’re the fastest growing B2B manufacturing platform that helps hundreds of companies produce products around the world. And I really appreciate you having me on today. Steve: Cool. Thanks for coming on. Hope you enjoyed that episode. And even if you don’t currently sell online, these latest rounds of tariffs will actually affect everyone. And if you do sell online, you better have an alternate sourcing plan going forward. For more information about this episode, go to mywifequitherjob.com/episode229. And once again, I want to thank Privy.com for sponsoring this episode. Privy is the email capture provider that I personally use to turn visitors into email subscribers. They offer email capture, exit intent, and site targeting tools to make it super simple as well. And I like Privy because it’s so powerful and you can basically trigger custom pop-ups for any primer that is closely tied to your store. If you want to give it a try, it is free. So, head on over to Privy.com/Steve, once again, that’s P-R-I-V-Y.com/Steve.